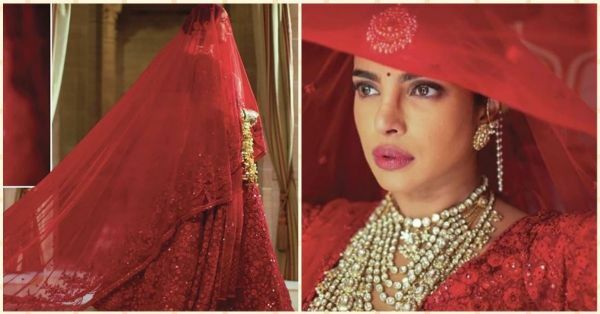 Priyanka's Laal Dupatta (& Outfit) At Her Red Wedding Was An Ode To Her Everlasting Love For Nick! Priyanka and Nick's regal wedding in Jodhpur had all of us swooning at the sheer beauty that the couple exuded. Our desi girl shined bright like a princess and her pardesi babu donned the role of Prince Charming perfectly. Their families, the decor and their radiant smiles had everyone thinking that it was a page torn out of a fairytale. Now I'm sure you've all seen the gorgeous white wedding video, with PC's 75-feet-long train, and Nick shedding a tear when he saw his lady love, but these new photographs from the Indian wedding are worth going gaga over. Priyanka's stylist Ami Patel shared some inside pictures from Nickyanka's big day and here comes the gorgeous Bolly bride. PC wore a bright red Sabyasachi lehenga and didn't want any gold or pastels taking away from the traditional look so it was a full-on red on red extravaganza. 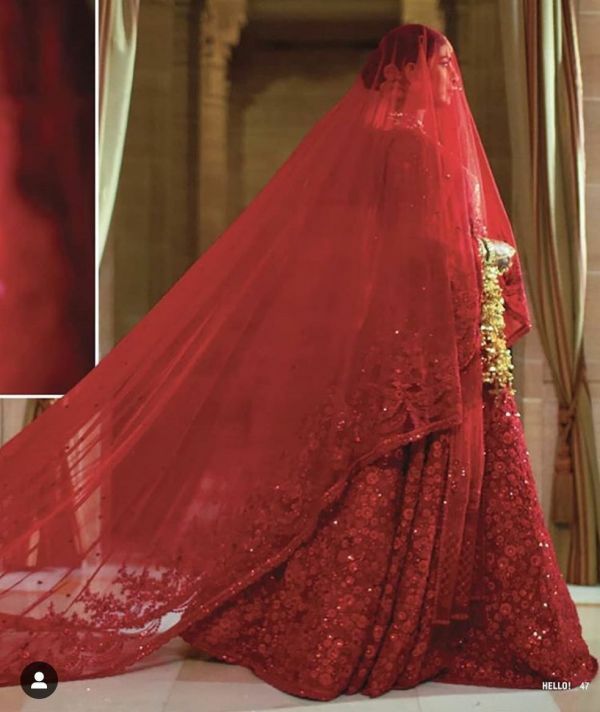 The outfit was hand-embroidered and had hand-cut organza flowers, French knots in silk floss and red crystals adorning it. It also took 110 embroiders 3720 hours to create this masterpiece and we are completely floored. For jewellery also PC chose Sabya so that the entire look ties in together. It was inspired by the age-old Mughal jewels of uncut diamonds, emeralds and Japanese pearls and even had diamonds cut into tiny stars to give the otherwise traditional set a more modern twist. 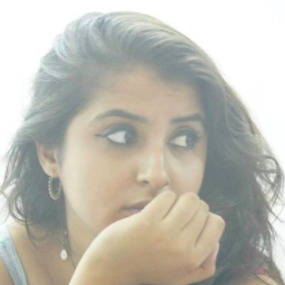 She wore a statement layered necklace reaching below the waist, a kamarbandh to accentuate her waistline, a maang tikka of the same diamonds and a nath to finish of the entire ensemble. The kaleeras were designed by Mrinalini Chandra and they added the hint of gold to the ensemble. Nick also wore Sabya for his big day and his silk sherwani was paired with a hand-embroidered Chikankari dupatta and a chanderi safa. He also paired it with a rose cut kalgi and diamond necklace from Sabya as well. And one with the fam-bam! Aren't these photographs just gorgeous?! PC made for a stunning bride and we love this adorable couple. We've got lots more coming on the Nickyanka front so stay tuned for all the deets.